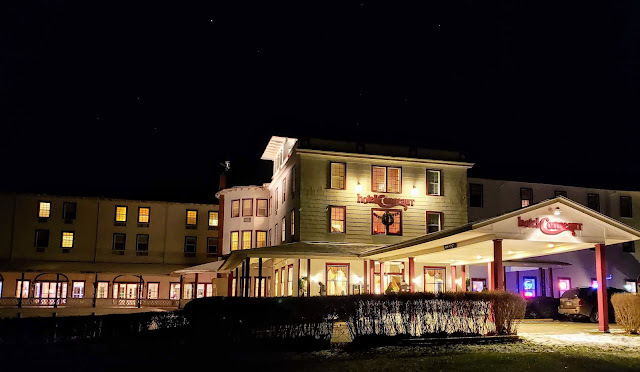 The ghosts of Hotel Conneaut welcomed us for a hauntingly romantic Valentine's Day weekend overnight stay and ghost hunt. First opened in 1902, much of the hotel remains in its vintage state - and lacks some modern conveniences. There is no elevator, but there ARE ghosts! In 1893, the Exposition Park Co. built a new resort hotel on a lake front parcel of property on the southern end of what was then known as Exposition Park. As the new resort -- the lakefront activities and amusement park -- began to grow and prosper, so did the need for accommodations. In 1902, construction began, enlarging the original Exposition Hotel into the new Hotel Conneaut (pronounced connie-aut). While most of the original hotel was demolished, one wing was retained and reused in the new hotel, and still stands to this day. The Hotel Conneaut boasted 150 guest rooms, a substantial hotel for its day. It was a popular vacation destination, especially for Pittsburghers and others in the region. 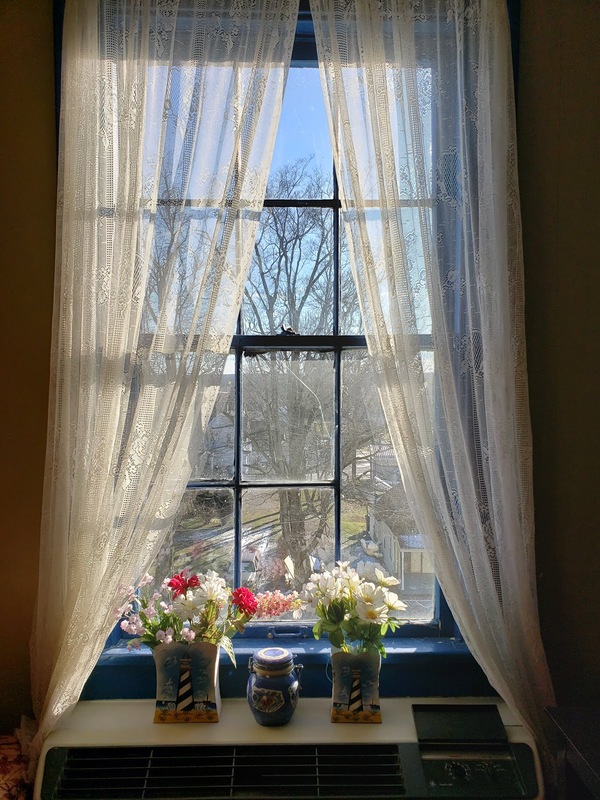 With Lake Conneaut on one side and an amusement park on the other, there was plenty to do, in a lovely setting. On April 29, 1943 the hotel was struck by lightening and the resulting fire destroyed more than half the roof. Newspaper articles of the time indicate that no one perished in the fire and that in fact, the hotel was still closed for the season. Unable to obtain permission to replace the damaged roof due to World War II, the damaged section was demolished, but eventually, was rebuilt. Inside, the floors are many levels, with unusually placed slopes up and down -- a result, I wonder, of the various remodels/reconstructions. 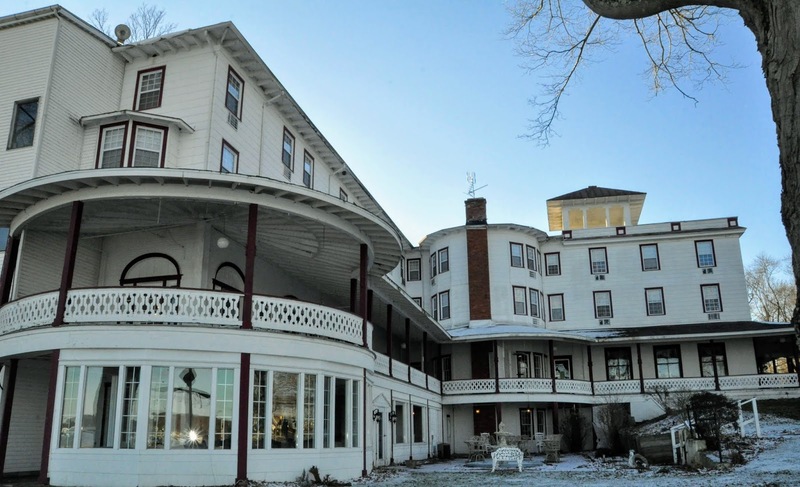 Hotel Conneaut was first made famous in the paranormal world by the Paranormal State episode in which Penn State Paranormal Researchers experienced a host of ghostly activity, such as seeing apparitions of the boy, the bride and the butcher. The team recorded doors closing on their own, various EVPs, and so forth. 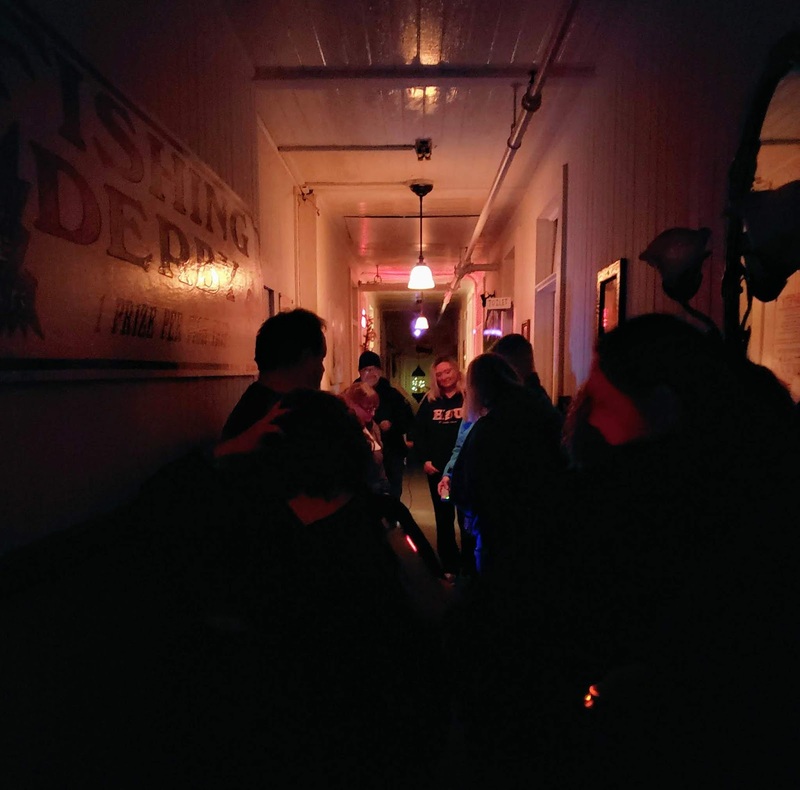 The employees hallway is a particularly active hotspot for paranormal activity. 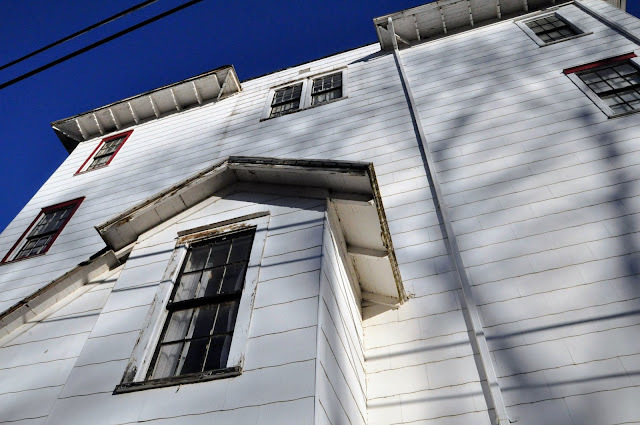 Although the episode eventually concludes that there's absolutely no evidence that there ever was a butcher who died in the basement kitchen -- or that anyone actually died on the property -- they, as well as subsequent ghost hunters and paranormal investigators, have experienced and documented various paranormal phenomena. 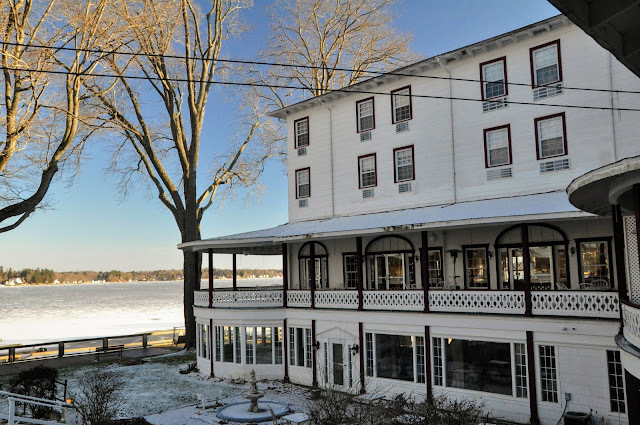 It appears the hotel is well and truly haunted, and there is some speculation that deaths on the property, whether on the lake adjacent to the hotel or in the amusement park, may be contributing to the paranormal energy in Hotel Conneat. 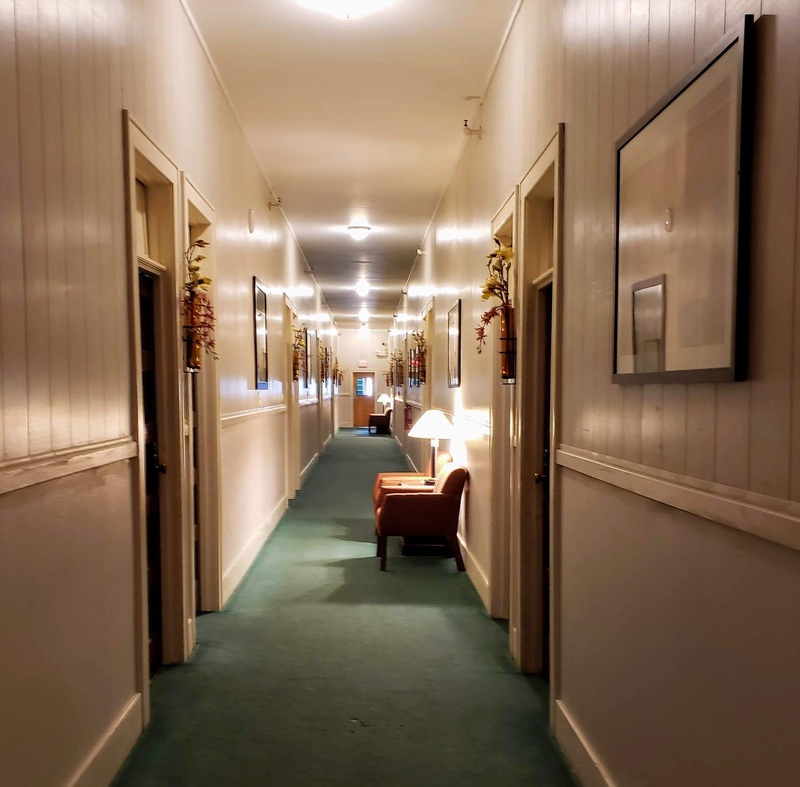 Ghosts N'at has visited the hotel numerous times, and the staff and guests of these visits have captured phantom voices, partial apparitions, doors opening and closing, and more. Orbs in the center (for what it's worth). 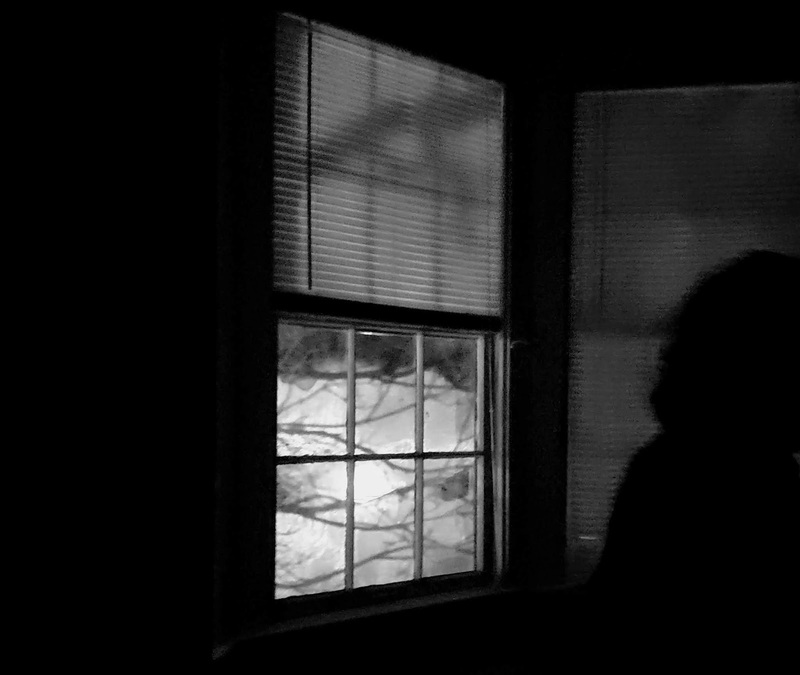 Did we see ghosts or experience the paranormal? 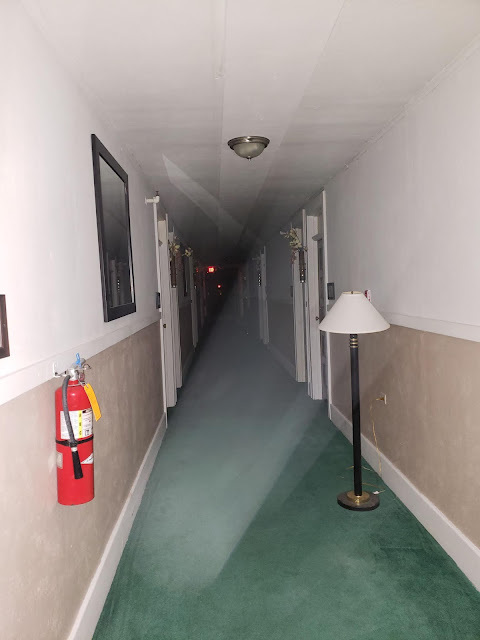 There were certainly some interesting EVPs recorded, and orbs in photos. 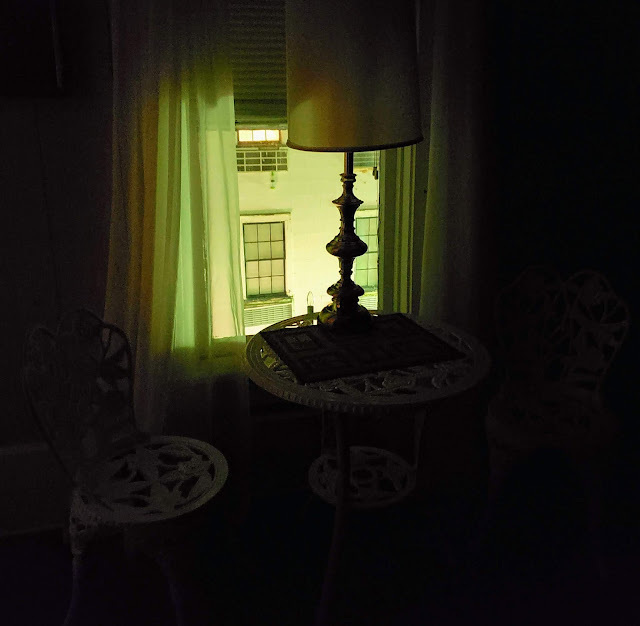 The spirit boxes and other devices spit out words in response to questions that were both confusing and convincing. 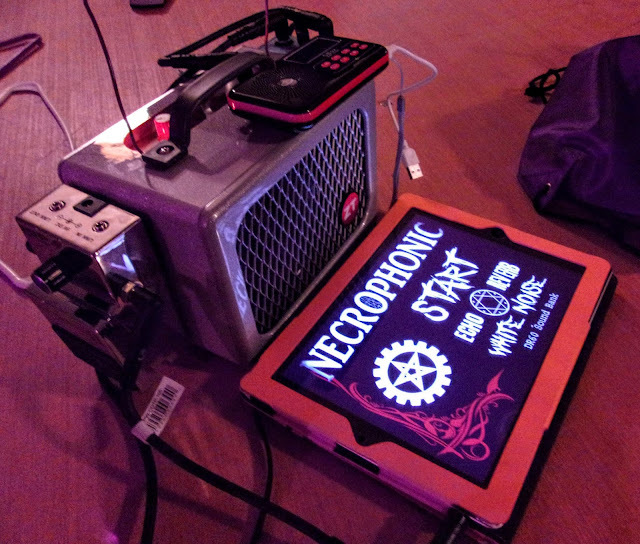 Many of the other guests brought their own equipment for the post-ghost hunt ghost hunts! Ghosts, as I've pointed out before in previous posts about ghost hunts, are not performing seals, that will be there to entertain you and perform on command. Ghosts were formally free-willed, free-wheeling people, and we all know people don't always live up to our expectations! 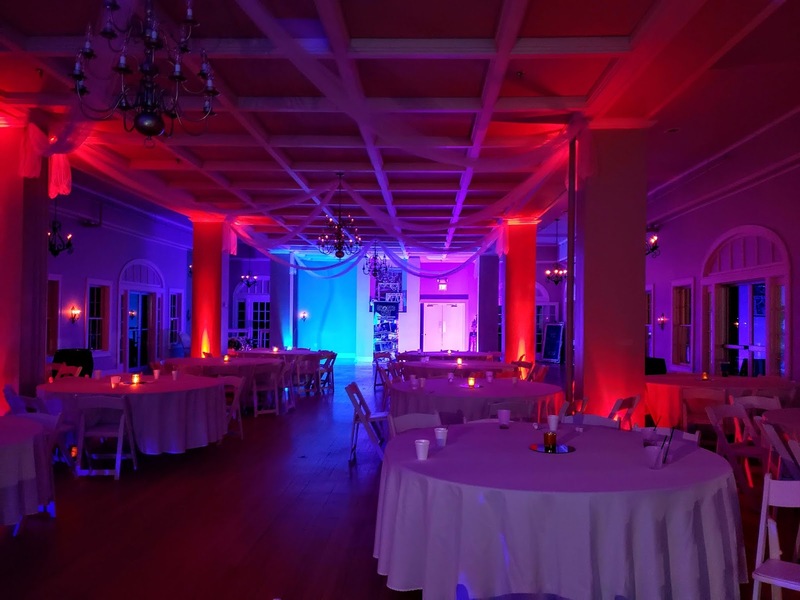 Brett McGinnis, the company's co-founder, starred on SyFy Channel's hit TV series "Ghost Hunters Academy." However, the evening and ghost hunt was well-orchestrated and entertaining, from check in promptly at 4 p.m. to splitting us into manageable groups to Ghost N'at's raffle of the most haunted room in the hotel at 11 p.m. and the end of the formal ghost hunt and release to continue ghost hunting on our own. During the hunt, we watched demonstrations of various ghost hunting equipment and got to see it in action. and ghost hunting tips as the event formally begins. Ghosts N'at ultimately is providing an evening of entertainment, the opportunity to dip our toes into a world with which none of us are very familiar. They do that well. 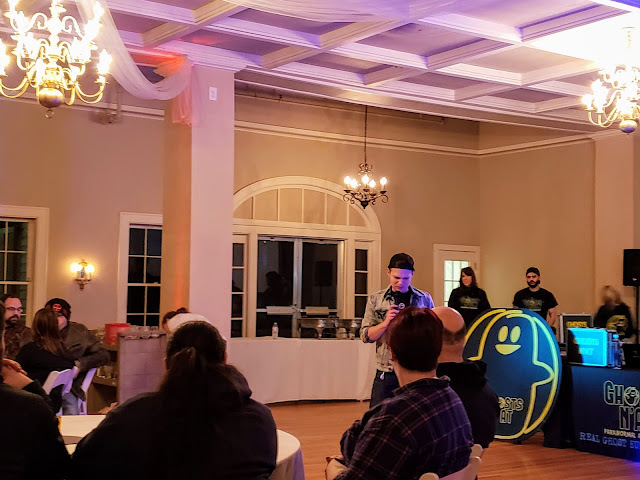 The staff circulated with the guests, often joining the private ghost hunts or chatting with them, answering questions, providing ghost hunting pointers, and being generally pleasant and fun. Although I'll continue to occasionally plan my own ghost hunts, I will definitely be looking for Ghosts N'at hosted hunts in the future. 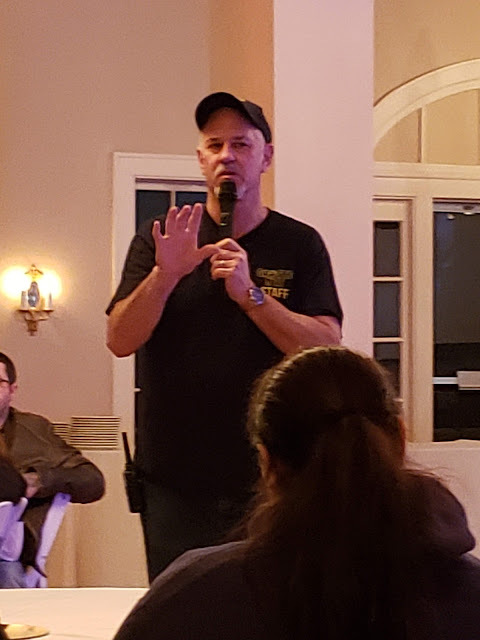 They provide a lot of equipment that I'll never have on my own, and in the three times I've participated in their ghost hunts, have proven to be excellent hosts. Today Hotel Conneat is showing her age. 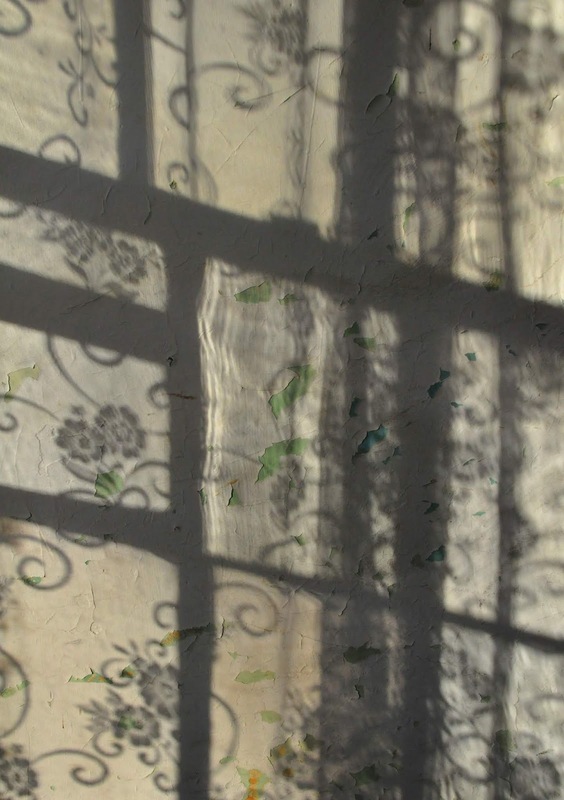 Many of the rooms have not been recently renovated and the edges all seem gently frayed. We only had cold water in our room, but it's my understanding that all the other rooms enjoyed both hot and cold running water. Like its ghosts, Hotel Conneat is starting to blur its edges, a quaint reminder of a heyday that included colorful characters who now serve as the basis for its ghost stories. * For MidAtlantic DayTrips' previous ghost hunts with Ghosts N'at, check out Anderson Mansion and Carrie Furnaces. Yes, I am very enthusiastic about Ghosts N'at. These are my independent views. Ghosts N'at has not solicited these articles, nor do I have any arrangement with them in exchange for favorable articles. 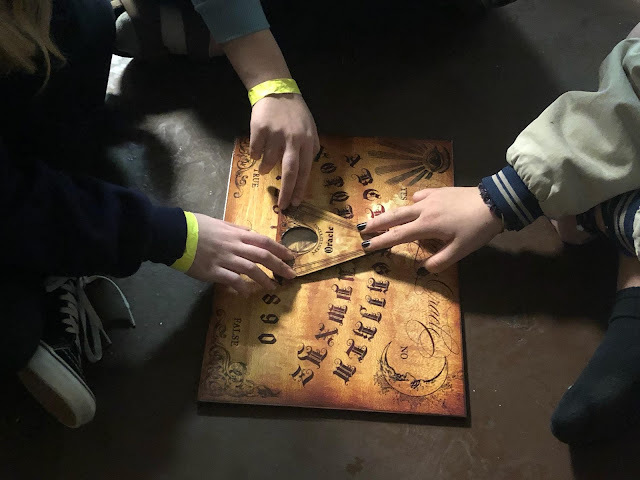 Some of the other guests also brought a ouija board.